$875.00 Order of the Patriotic War, 1st cl., Type 2 Var. 1, #27914, circa September - October 1943 issue. An exceptionally scarce early version with very thin spokes on the reverse of the golden starburst and gold-plating on the reverse of the silver star. This is one of the first of the 1st class screw backs made after the change in design from the suspension type. In very fine condition. $995.00 Order of the Patriotic War 1st class, Type 2 Var. 1, #158601, awarded posthumously to a commander of an SU-76 self- propelled gun killed in action near Krakow in January 1945. The award commendation is among the most succinct we have seen. The order is in near mint condition, as would be expected of the award that was never worn (according to Soviet archival records, it was given "for safekeeping as memory" to the widow of the fallen hero.) Comes with archival research. $950.00 Order of the Patriotic War 1st cl., Type 2 Var. 2 (with two- line mint mark), #306931, with a document, awarded to a Guards Naval Infantry platoon commander. He earned the award in the heroic naval assault at Eltigen, Crimea in November 1943. After making a fighting march through the enemy-held territory and even seizing a part of the city of Kerch for a while, the surviving Soviet marines were eventually taken off by boats. Although ultimately unsuccessful, this operation becаme legendary in the Soviet Union and to this day remains a part of Russian naval infantry lore. Тhe award decree was issued in 1943, but the decoration and document were delivered to the recipient long after the war, in 1950s. The set includes a copy of the award recommendation from the Russian archives. $790.00 Order of the Patriotic War 1st cl., Type 2 Var. 2, #317985, with a 1972 order booklet, awarded to a machine gun platoon commander for bravery during an infantry assault in East Prussia. In a single skirmish, he prevented an ambush that threatened his unit, killed six Nazi soldiers, and suppressed two weapon nests. Although wounded, he chose to remain on the battlefield until the fighting was over. The award was officially bestowed in November 1944, but it was only delivered to him nearly three decades later. Both the order and the document are in near mint condition, simply impossible to upgrade. Comes with a copy of the award recommendation from the Russian archives. $640.00 Order of the Patriotic War 1st cl., Type 2 Var. 2 (with two- line mint mark), #319305, circa 1960s issue. In solid 14 K gold and silver. Although undoubtedly bestowed for WW2 exploits, this is a belated award issued long after the war but well before the Type 3 "jubilee" issue of 1985. A relatively uncommon piece in excellent condition. $45.00 Order of the Patriotic War 1st cl, Type 3, #1475307, 1985 issue. Superb example with beautifully preserved, bright gilt and practically flawless enamel. $1,450.00 Order of the Patriotic War, 2nd cl., Type 1, Var. 3, #31780, awarded in June 1943 to a signal battalion commander. He distinguished himself by providing communication lines for the 18th Army during the defense of Tuapse and in support of the famous Malaya Zemlya beachhead near Novorossiysk. The order is in very fine condition, far better than a typical Type 1, and includes complete, original suspension device with intact celluloid cover. Comes with comprehensive archival research. $1,200.00 Order of the Patriotic War, 2nd cl., Type 1, Var. 3, #19613, awarded in June 1943 to a military topographer of the Southwestern Front for his contribution in building fortified defense lines. A highly unusual award recommendation! The order has not been re-converted and includes complete original suspension device. In fine overall condition, an attractive piece despite some enamel damage and repair. Comes with archival research. $160.00 Order of the Patriotic War, 2nd cl, Type 2 "Starback" variation, #96052, circa mid-1944 issue. An uncommon piece from a small series produced by the Krasnokamsk Mint in the first half of 1944. In fine to very fine condition. $295.00 Order of the Patriotic War, 2nd cl., Type 2, "flat reverse" version by the Krasnokamsk Mint), #705442, awarded to a Sergeant of a storm detachment of the 1st Belorussian Front for the Vistula - Oder Operation in January 1945. During an infantry assault near the Polish city of Warka, he was one of the first to jump into an enemy trench where he killed 7 German soldiers. 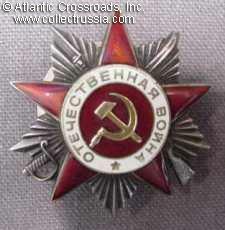 Later, he earned an Order of Bogdan Khmelnitsky 3rd cl. - a highly unusual award for an NCO - by leading an attack on the Seelow Heights on the first day of the Battle of Berlin. During street fighting inside Berlin, he destroyed a heavy tank with a captured Panzerfaust. The order is in excellent condition. Comes with archival research. $445.00 Order of the Patriotic War, 2nd cl., Type 2, by the MZPP factory, #666619, circa early 1945 issue. An extremely interesting and rare piece with a screw post base added by the original manufacturer. A few other MZPP specimens with the same feature have been observed in its serial number range. In very fine to excellent condition. $360.00 Order of the Patriotic War 2nd cl., Type 3, #6540243, with a document and original issue box, 1989. A very uncommon special issue to a foreigner, apparently a Czech national. The document has facsimile signature of Mikhail Gorbachev and differs in many other details from the common 1985 version. The award and order booklet are in near mint condition. $25.00 Order of the Patriotic War 2nd cl, Type 3, #2792237, 1985 issue. Variation without the circular depression around the screw post. Excellent condition. $70.00 30th Anniversary of the Victory over Germany miniature Wall Plaque, Korosten, 125mm diameter, hand painted. $70.00 35th Anniversary of Victory over Germany, porcelain memorial plaque by Baranovka porcelain factory, 1980. The artwork features Order of the Patriotic War.